The month of Ramadan starts on June 18th. In recent weeks I have considered how I want to take part in this religious observance, which for many non-Muslims boils down to the subject of fasting: ‘To fast or not to fast, that is the question!’ As the start of Ramadan draws closer, it’s a subject that comes up often with fellow Peace Corps Volunteers, local Moroccan friends, and with people back home. Will I fast? If so, why? If not, why not? And, if I do plan to fast, do I plan to abstain from both food and fluids? During Ramadan people visit a mosque more frequently for communal prayer. 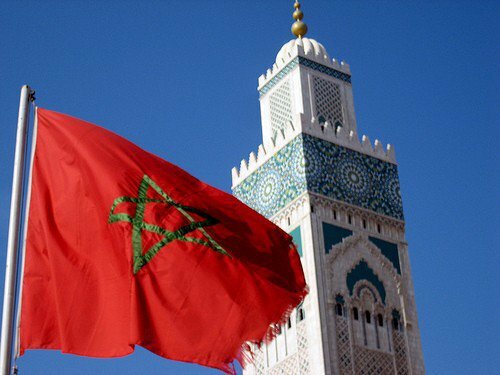 For those unfamiliar with Ramadan (as I was before coming to Morocco), the holiday is one of the five pillars of Islam, and takes place during the ninth month of the Islamic calendar. During Ramadan there is a deeper focus on prayer and spiritual connection, and Muslims refrain from eating and drinking between sunrise and sunset as a way to bring attention to one’s relationship with God. 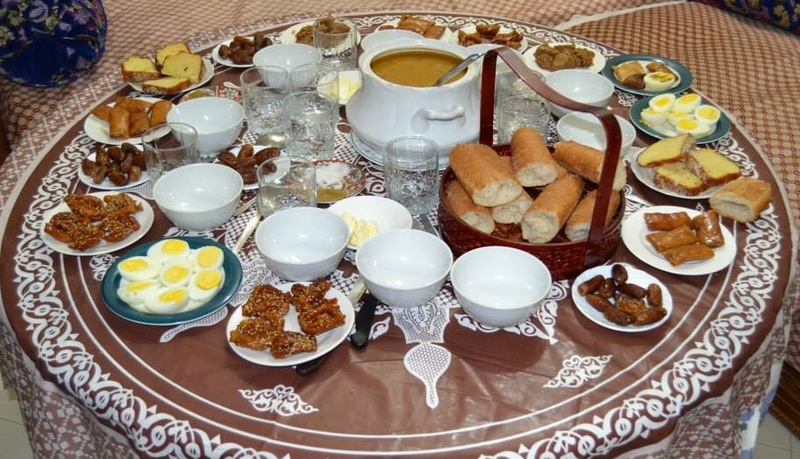 Many Moroccans I have talked to describe Ramadan as an opportunity to purify one’s body, mind and soul: By fasting from food and other earthly pleasures, one has time to feast on spiritual devotion. As a younger person I was involved with a religion that practiced a yearly 19-day fast, with a structure similar to Ramadan. But I never completed this 19-day fasting period. Looking back I recognize a number of reasons I didn’t follow through with the fasting process, but the main reason was this: my self-image at the time was quite poor, and trying to focus on my spiritual experience in the world made me feel terribly anxious and alone. So I would abandon the fast after a few days, claiming I was physically sick and therefore ‘unable’ to fast. A typical l-ftor (break-fast) meal. A traditional soup called harira is often served, as are lots of rich sweets like dates, chebakia and zmita! Today I have a much healthier self-perception than I did as a younger person. I now recognize that my own spirituality, which draws on several different religious and ethical frameworks, is enhanced and enriched by trying new things. I have learned that engaging with new spiritual practices often leads to discoveries about myself, and almost always these discoveries benefit me in some way. Fasting: I will fast from food for one week, but do plan to drink water. After this first week I will re-assess whether the fasting experience is impacting me more positively than not, and decide whether to continue. Spiritual Reflection: I plan to follow the Ramadan practice of incorporating additional periods of spiritual reflection throughout the day. I plan to use a variety of reflective materials for this purpose—sacred texts, poetry, scholarly writing about spirituality, inspirational art and music. And suggestions of nice things for me to read, look at or listen to are welcomed! Avoid Negative Speech: A third element of Ramadan practices I want to adhere to is abstaining from speaking negatively about others—‘backbiting’ as it is known in many religious traditions. Can I acknowledge that this feels like the most daunting part of my plan to participate in Ramadan? I far too often say things about others that are critical or mean-spirited, and I want to consciously avoid doing this for the month of Ramadan (and really, I want to try adopt this permanently). 7:30PM-8:30PM: l’ftor (the ‘break-fast’ meal) with family and friends. And I have to note how much I am looking forward to eating lots of zmita (also called sfouf or sellou) during Ramadan! 9:00PM-3:00AM: Social time in the community, visiting friends and enjoying the cool nighttime weather, time to rest/sleep. So there you have my plans for taking part in Ramadan. I will certainly blog about how my actual Ramadan experience goes, but I feel quite excited to participate in a way that (hopefully) impacts me positively both spiritually and socially, and doesn’t just challenge me physically. Happy Ramadan, everyone! May we all find deeper connection with ourselves and others in the coming weeks! Sounds like a very thoughtful and open way to approach this experience. There are many wonderful things to read that can help deepen and open. I’d be pleased to share some of my favorites when we chat. Thanks, Mom :) Let’s talk sometime next week before Ramadan begins. Hope you have a really good weekend. Love you. Thanks for sharing your thoughtful approach. I’m not planning to fast but this helps me sort through my feelings. I will certainly be adapting my schedule to the local one! A great film is Babette’s Feast in Danish but subtitled won foreign academy award in 1980s. Based on Isak Dinnesen/Karin Blixen story. She wrote out of Africa. This is a Thanksgiving tradition at our house. Great minds think alike. Our daughter was an exchange student in Denmark. Steve can put BF on Google Drive for you if you want. Have you seen short film Grisen (the Pig) on I tunesand very close to our experience here. So much to read- I love Rumi’s poetry of course, am now reading Tich Not Hanh’s book on communication…Today I returned from a 10 day silent Buddhist Medittion retreat so need to process and sleep.